James Tabor makes the claim in Cameron's documentary that a historical approach to the resurrection would imply that Jesus only rose from the dead spiritually. I suppose what we are to infer is that the earliest Christians simply believed Jesus rose from the dead in a spiritual sense but that his body remained in the tomb? Really? Let's consider a few things. "When it was demanded, he quickly put out his tongue and courageously stretched forth his hands, ﻿11﻿ and said nobly, “I got these from Heaven, and because of his laws I disdain them, and from him I hope to get them back again” (2 Macc 7:10-11). Note that the resurrection is described in bodily terms in the New Testament. Matt 28:5-6: The angel said to the women, “Do not be afraid; for I know that you seek Jesus who was crucified. ﻿6﻿ He is not here; for he has risen, as he said. Come, see the place where he lay. Luke 24:2-3:﻿ And they found the stone rolled away from the tomb, ﻿3﻿ but when they went in they did not find the body. 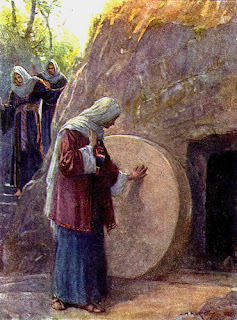 John 20:1-9: ﻿1﻿ Now on the first day of the week Mary Magdalene came to the tomb early, while it was still dark, and saw that the stone had been taken away from the tomb. ﻿2﻿ So she ran, and went to Simon Peter and the other disciple, the one whom Jesus loved, and said to them, “They have taken the Lord out of the tomb, and we do not know where they have laid him.” ﻿3﻿ Peter then came out with the other disciple, and they went toward the tomb. ﻿4﻿ They both ran, but the other disciple outran Peter and reached the tomb first; ﻿5﻿ and stooping to look in, he saw the linen cloths lying there, but he did not go in. ﻿6﻿ Then Simon Peter came, following him, and went into the tomb; he saw the linen cloths lying, ﻿7﻿ and the napkin, which had been on his head, not lying with the linen cloths but rolled up in a place by itself. ﻿8﻿ Then the other disciple, who reached the tomb first, also went in, and he saw and believed; ﻿9﻿ for as yet they did not know the scripture, that he must rise from the dead. Acts 2:25 ff. : [Peter said...] ﻿25﻿ For David says concerning him... 27﻿ 'For thou wilt not abandon my soul to Hades, nor let thy Holy One see corruption...'﻿ 29﻿ Brethren, I may say to you confidently of the patriarch David that he both died and was buried, and his tomb is with us to this day. ﻿30﻿ Being therefore a prophet, and knowing that God had sworn with an oath to him that he would set one of his descendants upon his throne, ﻿31﻿ he foresaw and spoke of the resurrection of the Christ, that he was not abandoned to Hades, nor did his flesh see corruption. ﻿32﻿ This Jesus God raised up, and of that we all are witnesses. But perhaps we are being too naive to think that Peter meant that Jesus' literally rose from the dead. Perhaps it was a lie. Or perhaps "resurrection" should be understood as a metaphor. Perhaps we are being too literal and all of this Easter imagery is more "mythological" than historical. 1 Peter 1:16-18: ﻿16﻿ For we did not follow cleverly devised myths when we made known to you the power and coming of our Lord Jesus Christ, but we were eyewitnesses of his majesty. ﻿17﻿ For when he received honor and glory from God the Father and the voice was borne to him by the Majestic Glory, “This is my beloved Son, with whom I am well pleased,” ﻿18﻿ we heard this voice borne from heaven, for we were with him on the holy mountain. In fact, outside of Jewish hopes, resurrection of the body was a laughable notion in the ancient world. Paul describes it as "folly" to the Gentiles (1 Cor 1:23). Thanks for Acts 2:25 ff. It's the scripture I was looking for. Well it goes without saying that there is no mention of a resurrection of whatever kind in 1 Corinthians 1:23. The converts to Jesus-worship in Corinth scoffed at the idea that God would choose to raise a corpse. That is what the earliest Christians believed. They scoffed at the idea of a corpse rising. For whatever reason, they felt that this made their resurrection impossible. Perhaps they believed Jesus had been a god, and so could live on in spirit form after death, but that they were not gods, and so only had a body, which all their experience told them would die and rot. Paul assuages their doubts by telling them that they will be resurrected just like Jesus was, and become a 'life-giving spirit'. Paul never tells the Corinthians that the resurrection is a resurrection of the flesh. Perhaps that was one of the beliefs that Paul called 'garbage' in Philippians 3:8. Paul didn't think the body would be rescued. Paul calls it 'foolish' to wonder how a corpse could come back. This was a moral issue for Paul. It was immoral to even want the body of death back. Adam had been given that body. Resurrected Christians would not be like Adam. When their corpse turned to dust, the dust would not be reformed into a living being. Instead, they would share the nature of the second Adam, and become a 'life-giving spirit'. By the way, 1 Peter 1:24 says 'All flesh is grass'. A strange thing to say , when trying to convince people that flesh will be resurrected and made mortal.